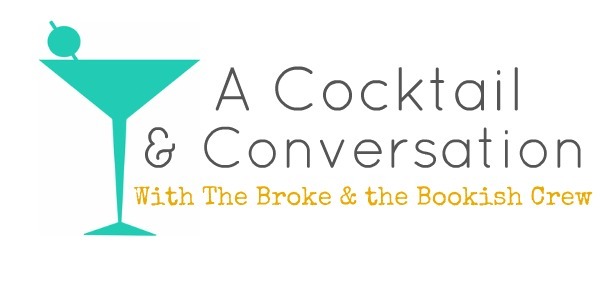 Every other Thursday here at the Broke & The Bookish is going to be A Cocktail & Conversation time. We'll pose a question to 2-3 members of TB&TB crew about books, life, music, etc and then they'll answer and we can converse about it. So grab a cocktail & cozy up for some conversation. It's 5 o'clock somewhere, friends. This week: Let's talk about The Casual Vacancy! Do you plan on reading it? How do you think Potter fans are going to receive it? Tahleen says: I certainly do plan on reading it. I grew up with Harry Potter, and though I know it will be extremely different from the fantasy series, I can't imagine it will be bad. What I'm nervous about is that I will be let down by it, but I'll just have to wait and see. I'm around number 100 on the library wait list at this point, which is honestly pretty good, so I'm hoping I'll get it in a month or two. Lori says: I think I want to read it. I saw someone say that they wanted to read it before they heard too much about it from critics. I would have to agree--I would want to read it before the critics got to it. Like Tahleen, I am worried that I might be let down by it. Of course it won't be Harry Potter, but I think Rowling deserves the chance to be more than just Harry Potter. I guess, bottom line, I'm on the fence about it...but I will probably read it at some point. Daisy says: I'm not fully convinced yet, I mean I LOVED Harry Potter and like Tahleen, I grew up with the books. BUT to me the premise of The Casual Vacancy doesn't sound all that exciting... I think I'll wait for it to be released in paperback, cause it's a lot of money to shelve out on something I'm not really sure of. But maybe it'll turn out to be amazing and I'll end up wishing I'd read it sooner. I can't imagine it'll be bad either, it just doesn't sound like my kind of book. What about you, dearest readers? Are you wanting to read it? Do you have any reservations about it? Do you think it's going to be judged harshly because of Harry Potter's success? My mom and I discussed this at breakfast today, she is going to buy the book for me, as long she can read it first. Overall, I am just excited to read something from Rowling and I hope it will be great on its own. I am a crazy Potter fan. I'm excited to read CV but expecting it to be different. I'm not rushing out to buy it though I'll wait until it's my turn with the library (I'm number 56 on the list). Potter had all my favorite elements YA, school setting and kids with powers. I know this will have none of those but I really enjoyed Rowling's writing style so I hope that even though I'm usually a YA reader that I'll still enjoy it a lot! I'm going to drop everything and read it. I completely missed out on the Harry books and probably will never read them now. I also want to read it before the critics go into attack mode. umm... if you haven't read the Potter books then you haven't missed out on them!! They contain WAY more then the movies do and you should go ahead and still give them a shot! I also agree with Ellie about it being worth reading if Rowling thinks it's worth publishing...I've read/heard interviews with her and she really does care about the quality that she puts out into the world -- She never seems to make any promises about what she will do next because she wants to see where her writing takes her and to make sure what she does publish is high quality writing. I'm intrigued to see what it's like. But reserved enough to know it won't be Harry Potter. Looking forward to reading it soon (I hope). I'm kind of nervous about this one! I'm actually not really that excited for it because I just don't think it will be nearly as magical (pun intended) as Harry Potter. I think I'll wait for reviews and see what people think! I definitely want to read The Casual Vacancy, because it is JK Rowling. I loved Harry Potter. Actually, I still love HP, but I am not sure this book is once that I would normally attempt to read. But since it is JK Rowling, and I think she is a great writer, I will have to give it a try. I think it is very courageous of her to try something new. I do want to read it. She is a fantastic writer, and I am curious to see how an adult book with no fantasy elements will be. It's not typically the type of book I read, but it does sound interesting. I am number 311 on my library hold list, but there are 53 copies circulating so it shouldn't be too long before I get it. I imagine like 2 or 3 months. I'm really excited to pick up Rowling's new book because I want to see what else she has to offer. I got into the HP series after seeing all the movies and have become a huge fan. Rowling is obviously super talented and i have no doubt she'll knock it out of the ballpark, even if it isn't all wizards and magic. I'd really hate for her (just like Radcliffe, Watson & Grint in the films) to become typecast. I think having range in what you do is what makes you such a success. I pre-ordered it. I wasn't sure if I was going to. I decided that I want to read it before I hear to much about it from critics, bloggers, etc. I don't expect it to be like Harry Potter, but not all the books I read are like Harry Potter. Variety is good. I'm looking forward to it, but I'm also trying not to let my expectations get out of control. Also, I am very impressed that she decided to write something so different that people ought to judge the book only by itself, nor in comparison with Potter. Guys, I just totally caved and bought it... But mostly probably because it was only 11 euros on the Book Depository and I can justify spending that on one book :) I'm not sure how soon I'll be reading it though, I'm still slightly scared I'll end up not liking it. But like many already said here: I do think it's very brave of her to try something completely different and it'll probably be awesome. But it's still scary. I am a little nervous to buy it... I haven't seen many reviews on it yet!!! I also caved in and got it on my Kindle (waaaaay expensive but I feel like I had to). I am going to read it as if it had a different author, without the HP shadow over it. I think that will be the best way to do it! I hardly ever buy books (I'm a student on a tight budget), and this won't be one of the exceptions. I agree that the premise just doesn't sound all that "wow". If I see it in a library, I'll read it. If not... I think I'll be okay! I am reading it now!! I seem to be different than most people commenting. I am underwhelmed by what I have read and look forward to the reviews starting to come in. I want to see if it will be something I am interested in. I know JKR is a talented writer, but that doesnt mean that I am going to like it if the subject matter doesnt interest me. Hence the reviews. So I'm going to wait a bit to see if I want to add it to the queue. I think I'm going to wait until the reviews come in. So far the reviews on Amazon are pretty polarized and I'm not really sure if I'd be interested in it. But definitely, JK Rowling is going to be judged on this book because of her HP success. I'm agreeing with Daisy, but even more hesitant. It just doesn't really sound like my kind of book, so I'll wait for what the blogging community says and then decide :). It will certainly be available at the library though, due to Rowling's popularity, so I shouldn't have to worry about getting a hold of it eventually! I am really looking forward to reading it. I will really give any book a chance.. I mainly read Young Adult (which you can tell by my blog) but I will give any book a chance. Typically I enjoy an author's other books because if I like an author's writing styles all their books can be good. Now I just have to get this from the library soon!!! Again I love these Cocktails and Conversations!! So fun!!! I pre-ordered it because I figured I would read it at some time. Also I want to read it before I see any reviews. I'm hoping it will come in the mail tomorrow as I don't want to wait all weekend! I actually think the premise is fairly exciting, but maybe that's just me! Being somebody who grew up with Harry Potter, I'll have to say that the least thing I'm worried about The Casual Vacancy is the "meant for adult audience" tag. As long as the writing is good (but it's JKR, so more often than not it will be), I'm willing to give it a try. I'm reading this right now! I loved the Harry Potter books and was skeptical about reading this one because of that ... BUT I was in town right by the bookstore the morning of the release so I picked it up. Can't wait to find the time to get through it all! Totally reading this, and I'm not expecting anything. It'llbe very interesting to see what Rowling has cooked up.